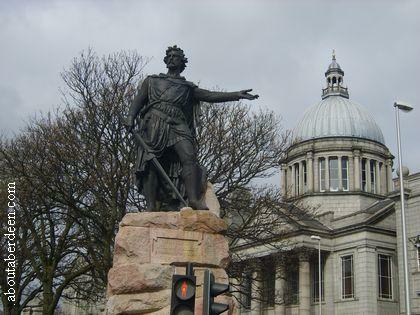 The monument to William Wallace was erected in 1888 and stands just outside His Majesty's Theatre and across from Union Terrace Gardens. It commemorates the life and sacrifice William Wallace gave to Scotland. His birth date is not known but is thought to have been either 1270 or 1276. His birth place is also in dispute and is thought to be either Elderslie in Renfrewshire or Ellerslie, near Kilmarnock. His father was Sir Alan Wallace and his brother was called Malcolm. Both were knights and both died in 1291 at the hands of the English. William Wallace led a group of men who would attack English soldiers. He led his men in two famous Scottish battles. The first was at Stirling Bridge on September 11th in 1297 where he was Captain to leader Andrew de Moray in which they won the battle. After the battle William Wallace was knighted and then elected as the Guardian of the Kingdom of Scotland and Leader of its armies by Robert the Bruce. He then became known as Sir William Wallace. In 1298 the English had invaded Scotland and their occupation resulted in the Battle of Falkirk on the 1st of April. Wallace's men were defeated in this battle and Wallace escaped capture until August the 5th, 1305. He was betrayed by Scottish Knight Sir John de Menteith, who was loyal to King Edward I. He was handed over to English soldiers at Robroystoun, near Glasgow. William Wallace was then taken to London for trial with the charge of treason and found guilty. On the 23rd he was hanged, though just before his death he was released and drawn and quartered and then beheaded. His head was placed on a pike at London Bridge. His arms and legs were also put on public display at Perth, Stirling, Berwick and Newcastle. As he was about to be executed he said that John Balliol should be reinstated as the true King of Scotland, rather than English King Edward I. Each year on the anniversary of his death events take place at the monument in Union Terrace and in nearby Union Street. Mel Gibson famously played William Wallace in the film Braveheart though it is sadly full of historical inaccuracies such as the names of people and the family history of William Wallace. It won 5 Oscars. 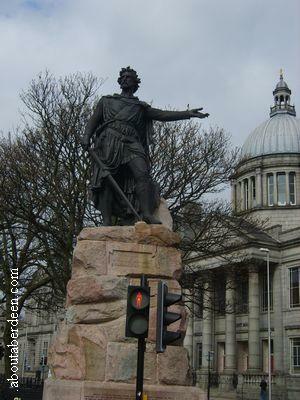 More Aberdeen statues and monuments.